Director of the Smithsonian Museum of Natural History Kirk Johnson came to the University on Feb. 28 and March 1 to meet with students and professors, deliver a talk about the importance of museum work, and enjoy the geology of the region. 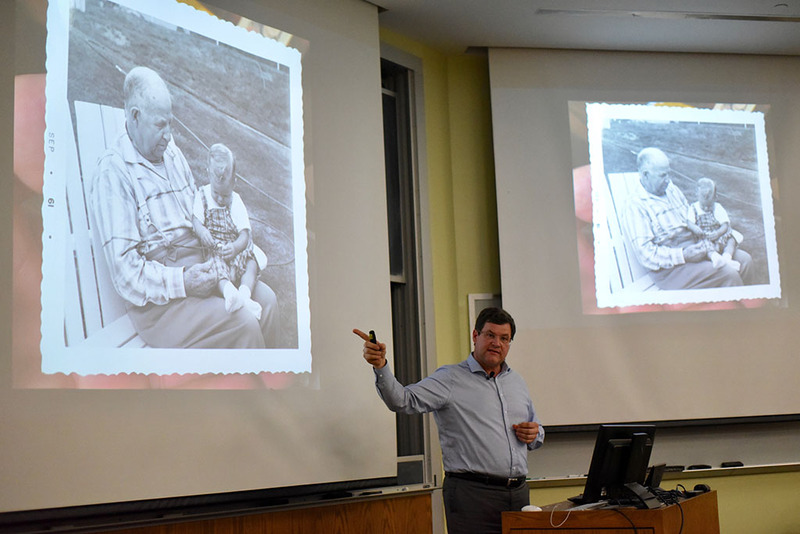 Johnson’s talk on Thursday evening, entitled “Natural History in the Age of Humans,” centered on the intersection of history and science within a museum context, and provided information on humanity’s role in the changing climate. Prior to assuming his current role at the Smithsonian, Johnson worked as a paleontologist and primarily researched fossil plants in a field known as paleobotany. He has also appeared in the NOVA documentary “Ice Age Death Trap,” which featured an expedition led by Johnson to recover over 5,000 bones from animals of the Ice Age. He later hosted a NOVA series entitled “Making North America,” for which he won a 2016 Kavli Science Journalism Award. After working as the chief curator of a smaller natural history museum in Colorado, Johnson came to the Smithsonian in 2012. Johnson met with students for a lunch and Q&A prior to his talk later in the evening on March 1. During the lunch, students posed questions about Johnson’s career path, the value of museum work, and the ways in which students can make a meaningful difference in terms of ecology and the environment. “You should all become museum directors—it’s the best job,” he said to students in the room. Johnson stressed the shared moral values of those working for museums, particularly when it comes to preservation of knowledge for future generations. “How do you see the natural history museum in the modern day maybe repairing that rift?” she asked. Johnson responded by noting that this was an issue he’d been grappling with for much of his career. 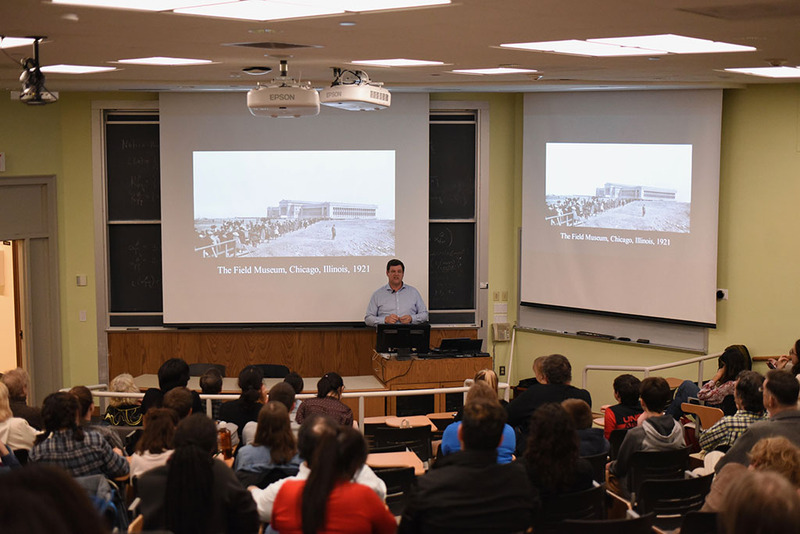 During his evening lecture, Johnson addressed a more mixed audience of students, children, professors, and community members. Professor in the College of Integrative Science and Earth and Environmental Sciences Ellen Thomas introduced Johnson, explaining that his presence at Wesleyan was part of the ongoing efforts to revive the University’s own natural history collection. Thomas mentioned the intersection between Kirk’s profession and Wesleyan history, particularly in reference to the first curator of the University’s natural history museum: George Brown Goode. After a warm round of applause, Johnson took to the podium, opening his lecture with a bit of history on the position he now holds and showing a picture of Goode standing in front of Easter Island Moai statues. Johnson then showed a picture of himself, standing in front of the same statues. Johnson then provided some of his own family history, speaking about his grandfather, whom he called a “cowboy.” He showed a photograph of himself, clutching his grandfather’s pocket watch at a young age. Johnson stressed the fact that his grandfather had been born in the 19th century, and yet still had a physical presence on Johnson’s own life: this, he said, demonstrated the rapid changes in history, and the age of the earth compared to individual lifespans. He also used the plotting of his family’s history against the current exponential population curve to show the incredibly rapid increases in population in context. Johnson’s talk then turned toward more of a philosophical look at both humanity’s impact on the planet and the changes within the human household, including technologically. Johnson then touched on the Anthropocene epoch, or the age of humans, which he sees in two different phases: humans significantly altering the landscape and the world around them directly, and humans significantly altering the climate, in more of an indirect fashion. Johnson talked a bit about his time at the Denver museum, with respect to one interesting project involving dioramas—little boxes of nature that were brought in and based on actual places. Johnson explained that members of his museum went back to the locations and took pictures of the places, realizing that these dioramas are “time capsules” in their old way, particularly in areas affected by climate change. Toward the end of his lecture, Johnson stressed the value of museums as localities for millions of people to gain access to information and incredible exhibits, in the natural world and beyond. He ended the presentation by going through images of the many collections at the Smithsonian, ranging from squirrels to mosquitoes to gems and minerals. He also commented on the role of humans, both in preserving natural history and in creating it.